Omcan 21479 MIXERS ETL Certified 30-qt Mixer. MODEL DW-CN-0660 Display Warmer This warmer is specially designed for displaying food while keeping a consistent temperature. It is also equipped with a temperature control. It opens from the back, and it comes with two pans. Model: DW-CN-0660 Description: Warmer Display with curved glass. Power: 1200 Watts Shelf Sizes: 10.25" x 25" and 12.75" x 25" Temperature: 30°-85° C / 86°-185°F Electrical: 110 V / 60 /1 Weight: 59.4 lbs. Dimension (DWH): 19" x 26" x23.5" Pan Size (DWH): 13.75" x 9.75" x 1.5" Packaging Weight: 140 lbs. Packaging Dimensions: 48" x 40" x 34 Item #: 21479. 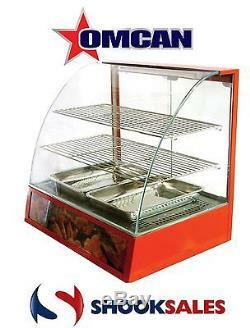 For over 65 years, Omcan has delivered quality products and services to the North American food service industry. Today we are proud to offer over 5,000 globally sourced food equipment and smallwares, to help our customers prepare, cook and serve. We have a robust distribution network with products available in one of our four distribution centers. We are now offering several extremely valuable FREE BONUSES on this item. No forklift or loading dock at your location. Unlike Many other Online Sellers We Also have A Physical Store and location which allows you to contact and recieve help quickly. Our restaurant equipment store with many items we are located at GENE SHOOK RESTAURANT EQUIPMENT 12583 Crenshaw Blvd. We have both new and used and always great prices! We specialize in refrigerators, freezers, fryers, griddles, stoves, prep tables, stainless steel tables, safes, char grills, keg orators, bar back, sinks, ice machines, and much more! The item "Omcan DW-CN-0660 21479 Commercial Curved Glass Hot Food Warmer" is in sale since Tuesday, December 6, 2016. This item is in the category "Business & Industrial\Restaurant & Catering\Commercial Kitchen Equipment\Storage & Handling Equipment\Heating & Holding Cabinets". The seller is "shooksales" and is located in Hawthorne, California. This item can be shipped to United States.